This is a retired disk we only have limited quanties. Puffy Foam is a high quality Ethylene Vinyl Acetate Foam that is made specifically for use on home sewing machines. It is non-toxic, water-resistant and machine washable, but it is flammable and cannot be dry-cleaned. It comes in two thicknesses for different stitching effects, and there is virtually no waste because even very small pieces can be used. Puffy Foam is available in 12 colors to match your thread color. It perforates cleanly when stitched through, and makes the stitching stand well above the fabric. It is being widely seen commercially in headgear and washable wearables. 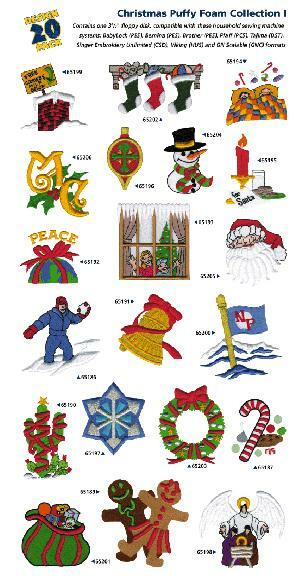 Look for special computerized embroidery cards made especially for Puffy Foam from your favorite sewing machine company.